On a hike — a very slow, short hike. I'm 31 weeks pregnant, and I am tired. I'm sore in various mentionable and unmentionable places, I've all but abandoned bending over to reach anything that's fallen (whatever it is will keep until someone else can), I shuffle and lurch and waddle instead of walk, and I can't get comfortable in any position. If I sit, the baby seems to have no place to go. If I stand, my left leg falls asleep. If I walk, my hips ache within minutes, and my pelvis starts to burn. If I lie down, my joints protest and various muscles cramp up on me spasmodically throughout the night. I'd like to just … not do much. Just sort of wait and gestate. But I still feel all this pressure to keep going. Because that's what we do, right? The modern woman? Or, probably, any woman? There's already the myth of the woman working in the fields, squatting to deliver, then tying the newborn on her back as she resumes her harvest. As long as the baby's inside instead of out, we're supposed to keep moving, keep working, keep taking care of things, keep exercising, and above all, stop being such a wuss. I went on a family vacation with my in-laws recently and got called out behind my back by my brother-in-law for being sort of detached and lazy. Well, it's true I did take a nap most days. But, look, dude-who-has-no-kids, I've had a steady and unexplained headache for the past three weeks, and my prescription iron pills are making me so nauseated and constipated it's like I'm back in the first trimester, and I'm up all night to pee, so sometimes I just really need to lie down. Next time you're carrying a human being under your skin to the detriment of all your internal organs, which are shifted and squooshed into unusual new positions, you let me know how awesome you feel. But I'm trying to keep going, because I don't want to be shamed for being the fat, lazy pregnant person who can't handle even a daily walk around the block. For one thing, being fit is supposed to help you handle labor more gracefully; plus, most of pregnancy weight gain often happens in these final weeks, and there's so much alarm over gaining "too much." So I have a goal of walking 3-5 miles a day (my current midwife was disappointed that I wasn't hip to doing something more aerobic than walking, so I've tried to keep up the mileage at least), even though, my belly support belt notwithstanding, my hips are falling apart and I start feeling pressure in my pubic area that unnerves me. I haven't kept up my walks every single day in past weeks due to family visits and unusual heat (I'm like a furnace already, so, seriously, I am so done with summer), but I've tried. The other day, I was out on my daily walk and passed a quartet of beach volleyball players I'd seen before, recognizable because one of the women is very obviously pregnant. That's the type of person who makes me feel like I'm letting down the team. There she is, maybe just a little less pregnant than I am, bouncing around, sweating (for fun! ), leaping into the air, running and diving for balls, and here I am, hobbling past her and feeling like a total failure. Granted, she's probably a decade younger than I am, and based on the meager evidence that she has time to play beach volleyball, this might be her first kid, but still — shouldn't I be one of those women running marathons hours before giving birth? Speaking of marathons, that's always the analogy for labor, right? It's like running a marathon. And I realize that means, analogy-wise, that it's an endurance event as opposed to a sprint. But, trust me, I'd find running an actual marathon a heck of a lot harder than having a natural birth. I am definitely not prepared right now for running a marathon — but do I really need to be? My births so far have been gentle, quiet experiences. Long, sure — my first one was 42 hours, a terrible marathon time. But still peaceful with lots of resting and resetting. I don't remember in either labor thinking, Gosh, I wish I'd exercised more! I had enough energy reserves and strength for both riding the waves and for pushing, in a position that worked for me. I'm not really much of a squatter, for instance, as it turns out. I've been trying to practice squatting again this pregnancy, just in case, and lately it's excruciating — literally too painful to endure. I think it's my pelvis telling me, Oh, my goodness, lady, STOP! And so that's what I wonder — is that what my body's telling me? To STOP? All the discomfort, all the pain, all the breathlessness and fatigue — is it just time to slow down? And have I been overly conditioned by cultural guilt and healthcare pressure not to give in? Not to mention the remorse I feel over letting my existing kids down by not being a super active and engaged mother while I'm feeling so tuckered out. My mom says her mother always told her, "Pregnancy is the one time you can absolutely justify putting your feet up and doing absolutely nothing — you're making a baby, after all!" Maybe I've lost some of that wisdom somehow, in all the expectations to keep on acting like you're not pregnant, to keep on pretending you feel fine when you feel like a beached, arthritic walrus. Because, here's the thing: I really do love being pregnant, in itself. I love how surreal it is that my baby is kicking and wriggling beneath my skin. I love placing my hand on my hard belly and feeling tiny feet poke out at me. I love anticipating this little one's welcome into the world. It can't be wrong to just want to enjoy that. To trust what my body is telling me, and to trust that the swimsuit-clad volleyball player's body is telling her something different. To be confident in taking more naps, and having fewer fitness goals, and just being, the baby and me waiting together. How is the third trimester or pregnancy in general for you? Do you have tons of energy to spare, or do you feel like slowing down as well? Haha, I love your honesty! I make a MISERABLE pregnant lady. Super whiny too. Just ask my husband (on second thought, please don't do that, eesh, I'm scared he might have some stronger words to describe me when pregnant). 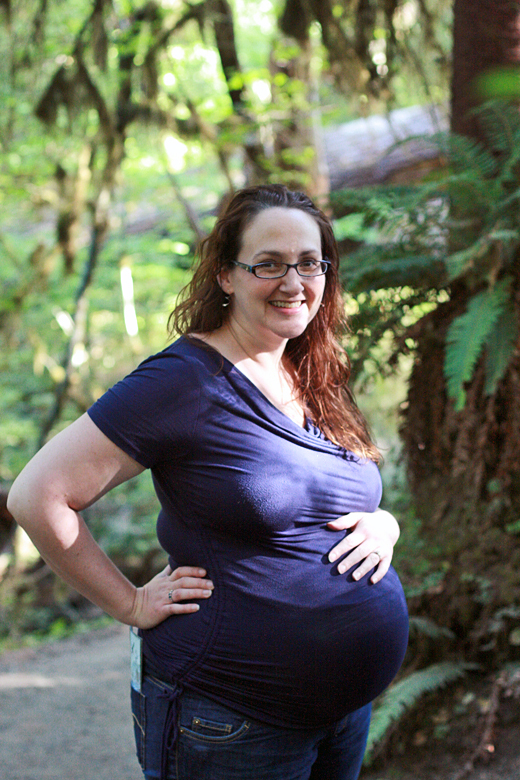 Sometimes I get it into my head that all the "natural mamas" are like, super fit and happy and zen pregnant ladies. Good to know that's just me being insecure. Ha. Also, I had short labors, but duuuuuuuude, ouch! I'm definitely no goddess super-zen poster child for natural pregnancy and childbirth, but I got the babies out and then I was stoked, so there's that. So did I read that right? 3-5 MILES a day?! Somebody needs to cut you a little slack here! I know, all too well, that hip pain and pelvic burn that make it feel like you're going to bottom out any minute. It is intense (and often worrisome..."am I going to split open down there if I take another step?")! Plus, PLUS, you have two little kids who NEED you, so you are constantly running at the fastest speed you can (which may look like a crawl to others, but it is, in reality, an enormous effort), despite that pain. Your brother-in-law and midwife sound like they have some pretty out-of-this-world expectations for you! That’s annoying! I say, good on ya for everything you're doing! Keep up whatever you can stand, and then sit down for the rest :). You're doing a perfect job! Ugh. This is so me. My whole pregnancy has been awesome on paper, but physically I've just struggled. First with exhaustion (of course) then with injury and now the heat is making me downright miserable. Here in the midwest I've had about a solid month where the weather was nice enough to walk and I wasn't struggling with a severe groin pull. But like you said, I just have to listen to my body, or my good-on-paper pregnancy might not have been. I may give the occasional jealous side-eye to others who are out enjoying this summer pregnancy in their bikinis and out being more active, but this is my body, my pregnancy, and it's mine to manage healthfully with my midwife. So here's to putting your feet up from time to time!! I remember feeling like a lazy wreck throughout my entire pregnancy - just a complete wuss. In the end, things quirks as they did and I made it through the 38 hours of labor, full of resting and stalling! A month before my due date, I totally freaked out. I hadn't been doing great at exercising anyway, but I had at least been trying--wanted to be in shape for birthing! But then I got sick with a stomach bug and then a cold, and also I hurt my back and my foot. I was so scared birth was going to be awful because my body was a wreck. I was forced to take it easy and not exercise for a couple of weeks so close to the end. And I was fat and tired, too, so you can imagine how much I exercised after I was feeling better. But I just got myself into this mental state that it was all going to be okay. Turns out, my birth was more like a sprint! And I didn't need to squat or even stand much. I would have had my whole labor sitting on the edge of the bathtub if I wasn't asked to move a couple of times (once to have cervix checked, once to get into birth pool to lower my blood pressure). I say walk a little bit if you can, but otherwise just take it easy. You really truly do not need to walk 3-5 miles! Also, get a massage and see a chiropractor trained in the Webster technique. Of course, I'm not really telling you what to do--just suggestions here! Do whatever sounds good to you. :) Hang in there, Lauren! @Inder-ific: Last pregnancy, I cried literally every single day during the third trimester. I'm lucky to have a patient husband, heh. @T: Well, to be fair, I go reeeeeaaally sloooooowly. ;) And yes on the splitting open — that's exactly the way to describe it! @Rachael: Yes! Let's both give ourselves a break! I am a total wuss about the heat. We moved here to Seattle from the Midwest, and I really appreciate the weather difference in general, but we've had an unusually hot summer, and it's killing me. I hope it cools off for you soon!! @LB Present: "Anyone not you carrying your beautiful child doesn't know what's right for you, only you do!" = love! Wow, 38 hours! It's good that we can rest through the long labors, huh? That's one of the lessons learned I try to convey to soon-to-be new mamas, that (most) labors have a lot of in-between resting happening. Seriously, how can you walk 3-5 without having to stop and pee like 6 times? @pianonee: Ha! Even though I'm not pregnant anymore, after three births, this is still a challenge, lol. I'm fortunate there are public restrooms on my route.